Ani is a geek girl, a legendary gamer and a 16-year-old Yale computer programming prodigy—basically she’s an outcast in her own right. 17-year-old Tyler can’t focus, even when he takes his ADHD medication. Tyler’s dad is dead, his mom has mentally checked out and his brother is in rehab again. Just when it seems Tyler’s life is on a collision course with a life sentence at McDonald’s, an exciting opportunity to test a flight simulator designed by Ani makes Tyler think his life might be turning around. Together, Tyler and Ani team up and discover that the simulator is being used for darker purposes than either originally realized. Playing Tyler is told from two points of view. Tyler, the 17 year old high school student, who has ADHD and is a huge gamer. Ani, the 16 year old, Yale freshman, from California, who was also an avid gamer before she started designing the games themselves. Tyler’s brother and father were in an accident where his dad passed away, but his brother survived. The survivor’s guilt made his brother, Brandon, turn to heroin. He’s battling his addiction in a rehab facility. Tyler’s mom is a lawyer who seems not all there. She’s lost her will to live with everything that happens and is basically going through the motions of life. Tyler looks up to Rick Anderson, an ex-military operative, who now works in the private sector. His company’s newest project is a flight similator and he thinks that Tyler would be the perfect candidate to test out the new software. He sets Tyler up with some fancy equipment in his bedroom and Tyler spends his days flying make-believe drones over a map of Afghanistan. Ani is the brilliant 16 year old designer of the flight simulator that Tyler is testing out. She goes over to Tyler’s house with Mr. Anderson to make sure he’s set up properly for the game. There’s an instant attraction between both Tyler and Ani. Tyler is the only one to act on it at first and sends Ani multiple texts and emails trying to get her to talk to him. Of course, Ani is forbidden from talking with any of the testers since it will compromise the project. Tyler is persistent though and will not give up! I really enjoyed watching their romance develop. It brought me back to my teenage years when I used to have crushes on boys and how I always overanalyzed every little thing! At first, I wasn’t sure if I would like the book because of the way it’s told from Tyler’s point of view. It’s choppy and his thinking is all over the place jumping from one thing to another. However, I quickly got used to it and I think it helped to define his character since the reader is able to really get into his head and see how his thought processes work. Towards the end of the book is where the excitement really picks up. Tyler and Ani come to a realization that things are not what they seem. I can’t say too much without giving the story away, but it’s very suspenseful and makes you want to keep reading to see how it plays out. 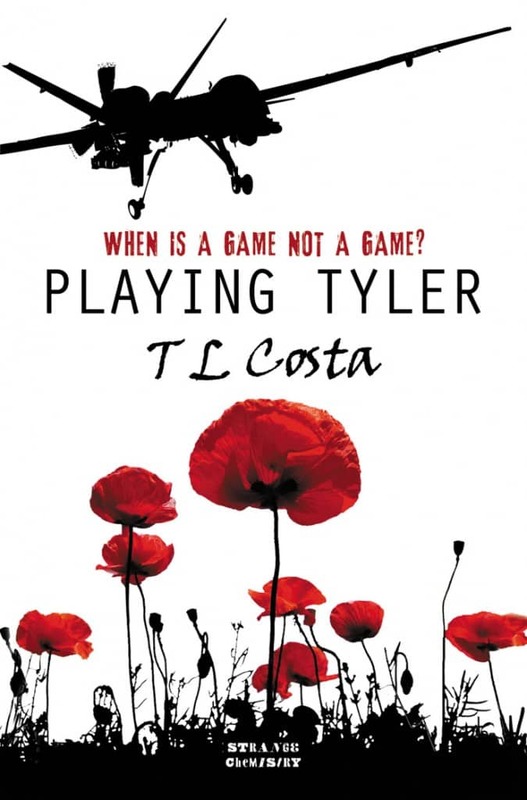 Playing Tyler is an excellent book for teens (and adults who enjoy YA). It has romance, suspense and is an easy read. The author made me feel connected to the characters and I cared what was going to happen to them. There’s a point in the book where I even shed a tear. I’ll be recommending this book to my 15 year old daughter to read. My son has ADHD and I think this is a book I would like him to read — maybe we can read it together. Goes on my “to read” list. I LOVE that there is a geeky GIRL protagonist in this book! Great message for teenage girls that being an introverted brain is a good thing. Wow, seems intense! But all in all a good read. My brother had ADHD growing up and it was really tough, he was on medications for it and struggled in school so I can relate to this book in that sense. Great review! Sounds like a super book for my neice or nephew! Thanks for the review! This is a book my niece would love to read because she is always reading and looking for something different to read. Sounds like a great story that I would even enjoy! A lot of teens can relate to this novel for sure. There really are a lot of good and relevant YA books and this seems to be one of them, thanks for your review! I sounds like an emotional read filled with intensity. Most teens will relate to several of the feelings and themes you mentioned even if they don’t consider themselves like the main characters. I like the idea of it being told from both viewpoints. Sounds like a good book for growing up, maturing, and developing relationships. On my to-read list for sure! Thanks. Sounds like a book my teen niece might like! I like reading YA books and you made this one sound interesting. Thanks for the review. Sounds like a book my niece would love to read! That girl reads A LOT! And she loves books like this with a geeky girl protagonist in the story! Alot of children have ADHD now a days . I think this would be a good book for them and also the parents to read. They need to take their medications regularly. Thanks for the information on the book. This certainly addresses some of the difficult issues of our time – addiction, ADHD, family dysfunction. Looks absorbing. Great review, I would love to read this…I teach special education, and provide services to many students with ADHD, so this book sounds very interesting to me!